In January 2012, BHE Renewables completed its acquisition of Topaz Solar Farms from First Solar. The 550-megawatt photovoltaic power plant is located in San Luis Obispo County, Calif., and is one of the largest single solar projects in the world. The project is synchronized to the California ISO grid, moving California another step closer to achieving its mandate to generate 33 percent of its power from renewable sources by 2020. According to an economic benefits study by The Brattle Group and California Polytechnic State University, in San Luis Obispo, Calif., Topaz Solar Farms is estimated to have infused $417 million into the local economy, the majority of which was generated during construction, with the remainder over the project’s minimum 25-year operating period. This included $192 million in compensation for approximately 400 construction jobs from 2012-2014 and also included $52 million in economic output for local suppliers, $14 million in sales taxes during construction, and up to $400,000 per year in new property tax revenues. Construction of Topaz Solar Farms began in November 2011 and reached substantial completion in late 2014. Pacific Gas and Electric Company purchases the electricity from the project under a 25-year power purchase agreement. The 550-megawatt Topaz Solar Farms has more than 8 million modules installed; the project covers 4,700 acres and provides enough electricity equivalent to powering more than 180,000 average California households. Electricity generated from Topaz Solar Farms displaces approximately 394,000 tons of CO2 per year – the equivalent of taking nearly 74,000 cars off the road annually. 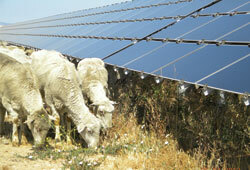 San Luis Obispo County, Calif., U.S.
View the Topaz Solar Farms fact sheet. ©2019 BHE Renewables. All rights reserved.